Pretty much every grocery store you frequent will have snacks waiting to bust your budget if you give into temptation while standing in line. They say to make sure you eat before you go grocery shopping so you don’t overspend and it’s true but what happens when you get the snack munchies instead? You spend more that’s what happens and it can be even pricier than just buying snacks down the snack aisle if you give in to the cash register snack marketing ploy. You would think it’s only the grocery store but it’s not. Have a look next time you go to Home Depot or Lowe’s and you will see they sell chocolate bars, drinks and beef jerky for any hungry customers waiting to cash out. 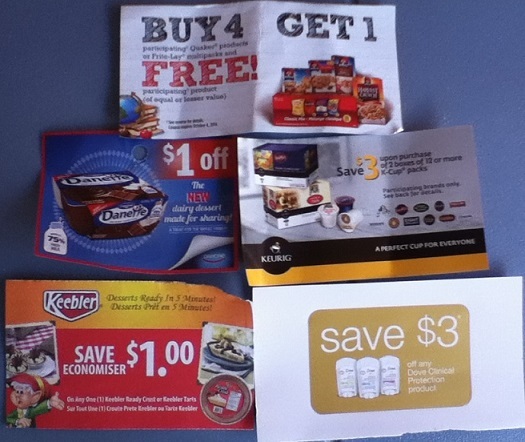 There is always marketing behind the grocery store from the minute you open your weekly flyer to the time you walk in the front doors. Money has to be made and whether it’s from the full-priced products customers buy to the customers who don’t care about weekly specials to the snacks at the cash register. 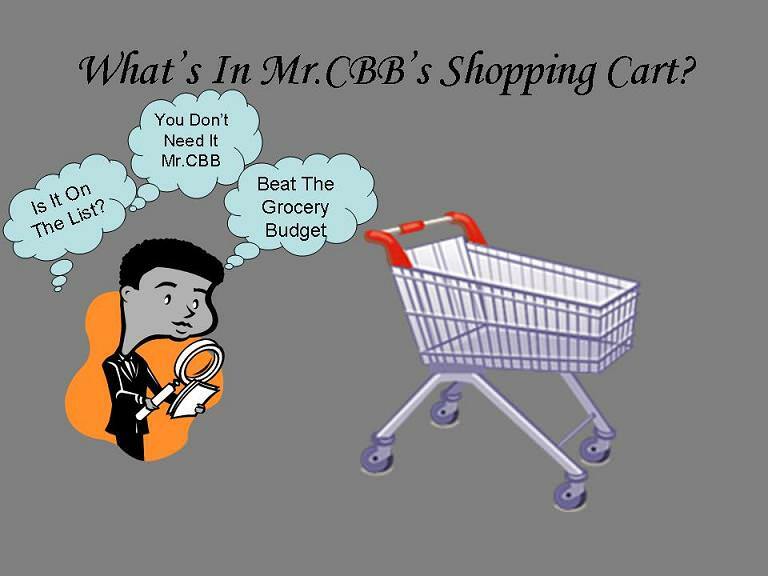 If your goal is to stick to a grocery budget it’s important to take note of the marketing around you no matter where you shop. I am always watching people when I shop and just the other day I watched a father with two kids (I’m assuming they were his) waiting in line at the grocery store. It’s always boring waiting for the person in front of you to get rung through the cash so aside from being nosy staring into their shopping cart, checking your Facebook status and chatting to other customers you may get tempted by the snack monster. The snack monster is the racks at the cash register loaded with over-priced chocolate bars, gum, beverages and chips. You know you can find them much cheaper if you would have picked them up down the snack food aisle but you waited until you were in line to crush your budget because you let temptation take over. The father I watched had his two kids touching the candy bars and other snacks and I was waiting for one of them to say “I want” which seems to start for all of us from a very young age. It’s when parents give in to the “I want” syndrome that we start the process of “I am owed” or “I deserve” something. The boy started crying when the father said no to him but it was only a matter of minutes before he gave in and the little boy had a Kit Kat in his hands. The minute he got his snack he had a smile on his face. That is the smile of immediate gratification and relief from crying for the father. Where do we draw the line though? It’s not just kids who fall prey to the snack wars at the cash register either. Plenty of adults load up the grocery belt with snack foods just because they get bored waiting and somehow convince themselves that spending double for a chocolate bar or pack of gum is worth it. I think not. If you find that you can’t control your urges for snacks when grocery shopping pack some healthy snacks to take along with you for the kids and yourself. This will certainly curb that wish to buy something that your grocery budget doesn’t need. In the end if you really want to stick to your grocery budget than you must be strict not only with yourself but to those you bring shopping with you. How do you stop yourself from buying snacks at the cash register? Each month I hold a draw and one WINNER is chosen. I will post the name of the person who has the winning grocery shop of the month right here so make sure to check back every week. Note: The second grocery game post for September is missing because I was unable to post a shop. We did not shop that week so it’s a no-shop week. Good news shoppers!! I just wanted to point out that I received a letter in the mail from President’s Choice stating that PC Points Plus program is now available at No Frills. I was happy to finally see the PC Plus Points available at No Frills as we stopped shopping there as much because we weren’t getting the points like we do at other PC stores. This is our last shop for September grocery game challenge. Next week will start October. Total to Carry Over Next Month: $49.30 leaving $185.70 to spend in October. Weekly Overview: We had a rough month for grocery shopping with the baby arriving. We have been eating fast meals such as soups, sandwiches, cereal, salads etc. We also had family over this past weekend so we stocked up on some things we normally wouldn’t buy like a case of figs, popcorn and crackers. Overall it was a decent month but we will work harder in October and hopefully have more time to make homemade soups rather than buy them. I could have been going over because I was babysitting my cousins daughter and buying extra snacks and stuff for the kids. I also had a little but more of an appetite then. I will try on my next post to calculate what a product costs with the PC Plus points taken into account. Lol Mr CBB!!! I used to write to a friend of hubby’s all the time as hubby wasn’t one for writing letters and it drove me nuts him complaining about not knowing where the guy was now!! But John used to say reading one of my letters was like sitting across the table over a cup of tea talking to me!!! I’ll take it as a compliment!!!! Thanks!!! Stuff going bad is usually only if we open something and forget about it or don’t get to it. Since July I can only think of a couple things other than produce – A can of spaghetti sauce in the fridge that I had no idea when I had opened (that was probably waaay before July) and some mozzarella cheese I had bought in a 1lb package and had planned to do pizza the following week but it got pushed back due to the ignitor going out in my oven. So by the time I got back around to it, the other half went bad. I typically now just get cheese in the 8 oz (half pound) packs, I use one whole chunk for a pizza and getting them on sale is $2.00 when a 1 pound on sale might be like $3.88… only 12 cents savings, but if something goes wrong such as that I am out $1.88! Finally getting caught up to where I should be! This is my week 4 of 5 for Sept. It’s not looking pretty for the month but I have 3 months left in the year. The only place I went was Foodland for this week. I am still under for the month but here isn’t much left for the month. This is going to be a rough month but there is still hope for the year. Especially with the holidays coming and all the extra baking and such there. I am looking for some good sales to stock up on and see what I can do with my various points programs to help out with that and the year end. I scored a nice rain check on 100% pumpkin @ 2 for $4.00 on a dozen cans at Save On Foods plus a rain check for 4 packages of Ground Pork @ $2.99/lb from Safeway. They’ll certainly get used through the holiday season. TOTAL UNUSED RESERVES $790.00 … that is a $400.00 carry-forward from 2013 and $390.00 in NEW 2014 savings. So, if you look at the $2,450.08 calculation that we have spent in 2014 and subtract the $390.00 we have actually saved in our “reserves” and the $229.96 ($135.96+94.00) we have recorded as spent but is actually set aside for future USA grocery shopping… we have actually spent $1,830.12!! That is $120.12 over the $1,710.00 we budgeted for January through September. BUT if you also take out the cash that was either a gift, some non-budgeted earning method or a loan repayment: ($104.04 Hiding Spot Cash from bottles etc + FREE $20 Safeway Gift Card + $80.00 Cash Repayment from a neighbor + $24.27 from a 2013 Costco Rebate Cheque + $0.00 used out of a 2014 Costco Rebate Cheque for $13.45 + a Christmas present of a $250.00 Safeway Gift Card+ $20.00 Thrifty’s Points Redeemed and $20.00 PC.Plus Points Redeemed+ $1.00 gift from hubby’s spending money) = $519.31 then we actually only used $1,310.81 of the budgeted $1,710.00 have a Budgeted Grocery Balance SURPLUS of $399.19 still sitting in our bank account. IF you don’t pay any attention to how we paid for the groceries, then the seemingly $120.12 overage combined with the value of an additional 5 weeks x $47.50 = $237.50 vacation we will be taking later on in 2014 and still leave us an additional $117.38 to add to our Canadian & cross border shopping budget. My wife was emptying out her purse this past week and found lots of change at the bottom. I don’t know why she doesn’t use her change purse sometimes lol. That was a great deal for pears and since you enjoy the pear sauce it only makes sense to take advantage of the deal. I wanted to make an spiced apple cider this week. There is something about the Fall an the changing colours that gets me in the mood. What will you make with your pumpkin? I want to make a pumpkin pie BUT I want to pick up a couple of the small cooking pumpkins from the farm rather than using the can. I want to roast them in the oven and see what the difference in taste is over the canned version of Pumpkin. Have you ever roasted pumpkins? Great job this week. You get ballot 21. Just completed my last shopping trip for the month and came in under budget! I also stockpiled a decent amount of stuff on the last few trips as well, so it is possible to near repeat this performance, say $180 next month since I don’t have the rewards or gift card to use. Anyways, here it how my last week went. I might write a blog post about why we don’t really stockpile food any more. How do you decide how much you buy so it doesn’t go off before the expiry date? Do you ever find you throw stuff out or donate because you simply can’t eat it all? You did great for the month, congrats! It’s rare we come in under budget these days. I swear we had a better year last year. I’m almost certain our budget will increase for 2015 as prices are just going up and up and coupons really aren’t like they used to be in Canada. Sure, they save money and we use them but not like we used to save. Great job mate! Looking forward to your October shops! Mr.CBB.. . P.S I left you a message on Twitter. I don’t usually have a problem with snacks at the cash register. My goal is to get in and out of the supermarket as fast as possible. I know exactly what I am going to bur before I enter the store. However, its a completely different story if one, or both, of my teenage boys come along. They fall for all the sales tricks that he store has to offer. They are a work in progress. I’m like that depending on how busy the store is. I cannot go shopping when I am hungry. That is my biggest downfall. I end up purchasing a lot more food and lots of things that I know I don’t need. I need to work on my self control apparently. Amazing all the meals we can drum up while we shop hungry lol. 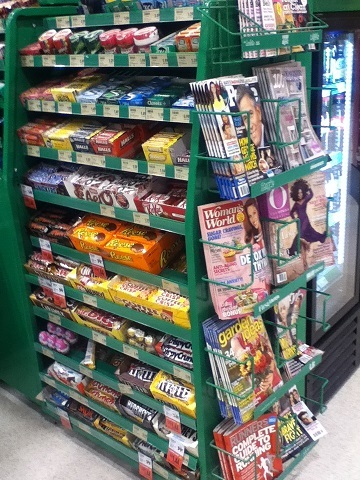 I remember, as a little kid, always getting to pick a candy bar at the check out line. It was the best part. But thinking about it now, between myself and my two other siblings, my mom paid over 3.00 just for candy. Good point Michelle… my wife told me today her grandfather bought her an Oh Henry every time they went out and this is a vivid memory she has. Maybe sometimes that expense is worth the memory. If I have tight budget, I don’t let my kids come with me to the groceries coz they get almost anything from snacks to clothes. My strategy also is I bring a list of items to buy so that I know how much I will spend and I won’t forget anything. The most important thing is no snacks, keep those eyes off from the snacks (chocolates) at the counter please! Hope you guys figure out the time thing and your little man gives you guys some time to do so! Our little miss was on a three hour schedule that made things very interesting for us!! Glad we had a full pantry, fridge and freezer to get us through it. Every time I go to the grocery store, I really can’t help myself buying my fave snack shawarma. 🙂 I tried to eat before going to the grocery and yes, I can say that it’s very effective that you can avoid buying snacks when you’re full but still the smell of the newly cook shawarma really tempt me to buy. I just have a rule where I never buy anything at the register. No exceptions. The snacks at the till was someone’s marketing success and a lot of companies are making big money because of it!! I hope you and the mrs can start eating different things soon. Too bad you didn’t do freezer meals or have family close by to help out or bring by a homemade meal for you guys. I always make some meals and treats for friends and family that have a little one or are just in need because I know how hard it can be. I am very happy to see that NF now takes the PC points card!!!! Looks like I will be getting the card now as I refused before due to not being able to use it at NF and I wasn’t about to go to the east end of town just to shop Zehr’s. If I’m going that far into town I’ll go to Food Basics or Walmart thank you very much!!! It’s quite the adjustment with a new baby in house especially for meals. It can be very risky trying to cook and look after the little one at the same time…. Been there and done that. Clearly you are helping your wife out more with Baby CBB a lot more than hubby ever helped me in those days. He was on midnights then so was working through the night and sleeping during the day. I am usually too busy unloading my groceries on the belt or watching the till prices to pay much attention to the candy and such there but my kids learned fast that whining at any time was a sure fire way to change a maybe to a strong no. If they were lucky they got one warning…Are you whining??? With one of those looks that we parents can get very good at. They learned that when Mom says no she means it. It was a very handy lesson to have them know by the time the teen years hit!!!LOL!! Hugs for the Mrs and the Little CBB!!!! I know we were just as happy to hear they finally offer the points at No Frills. I change nappies, feed baby, wash clothes, fold clothes, cook, clean, hoover up… I do it all!!! That seems to be a popular item at the cash because most people just want to buy one pack as opposed to a full bag.